As you look up at the sunlight shimmering through the clear blue water, a throng of jellyfish passes you by as if you weren’t even there. There are few places on earth that can transport you to an entirely different world, but we think we’ve found one…and you can start your adventure with our Palau Travel Guide! Want to learn more about Palau? When is the best time to visit Palau? Palau has mostly consistent weather, so you can plan a trip here anytime of year that works for you. That being said, you should expect heavier rain throughout late spring, late summer, and mid fall. Winter (December to March ) is the most popular time to visit, though prices may be higher and there could be crowds at some of the more popular dive sites. Palau is located on an archipelago in the western Pacific Ocean. It has no land borders, however it has maritime borders with Indonesia, the Philippines, and the Federated States of Micronesia. 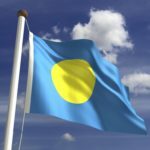 Citizens of most countries (including Canada) will receive a free 30-day tourist visa upon entry to Palau. American citizens will be granted a 1-year visa thanks to existing agreements between the two countries. How do I get around Palau? As there is no regular public transportation outside of Koror, you’ll have to rent your own car to really get around the islands. Organized day trips are also available from Koror. 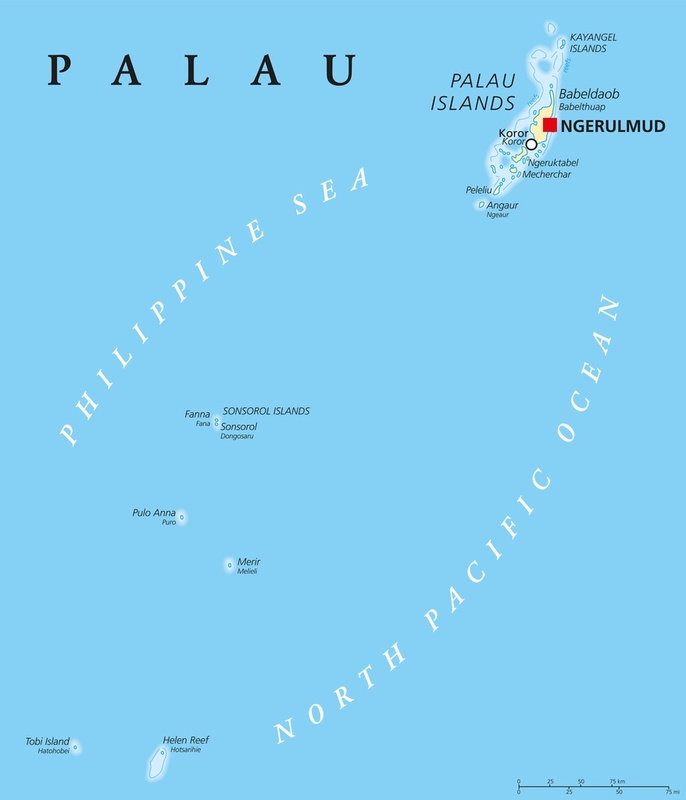 The official languages of Palau are English and Palauan, which are both widely spoken. You can also hear some local languages as well as Japanese (mostly amongst older Palauans) and Filipino. Overall, you should be able to get by fine with just English. The base camp, so to speak, of any expedition to Palau is likely to be Koror – the largest town in the country. The majority of the population lives here and, as such, it serves as the hub of most of Palau’s tourist trappings and services. There’s a surprising amount to see and do in the town itself, including unique architecture, some interesting museums, and fine restaurants – although at the end of the day Koror serves as a home base from which to explore the more wild and unique parts of Palau. Babeldaob is one of the largest islands in all of Micronesia (yes, we know that by definition that doesn’t sound very impressive), and is home to a few worthy inland sights. First and foremost are the stone monoliths of Badrulchau. With structures reminiscent of the world-famous Easter Island and stunning views of the sea, this is one of the best places to simply relax and take it all in. It doesn’t hurt that the island itself is relatively sparsely populated and underdeveloped – so while it might not be easy to visit, it is peaceful. The other key attraction on Babeldaob is the picturesque Ngardmau Waterfall, which is exactly what it sounds like. From Palau’s admittedly small (by global standards) highest peak, Ngardmau Waterfall is easily accessed with a short and rewarding hike. Perhaps even better are the cool, refreshing waters at the base of the falls, which are just asking for you to jump in. While you might have come for the ocean, Ngardmau Waterfall is just another example of Palau unexpectedly pulling your attention inwards. For history buffs there are few places in Oceania better than the island of Peleliu. 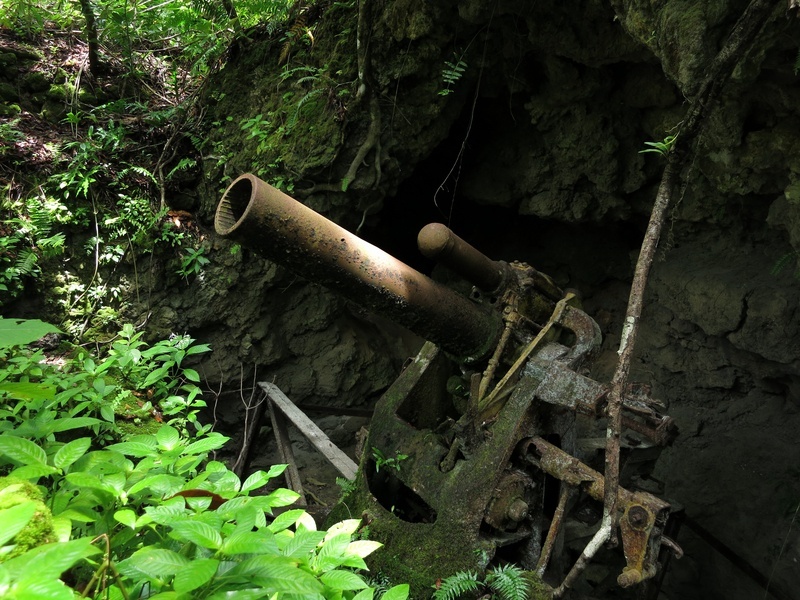 As the site of the eponymous battle between Japan and the US in World War II, remnants and remembrances of the conflict are still found throughout the land. The entire island is a US National Historic Landmark and it’s easy to see why. Across Peleliu you can find the WWII Memorial Museum, abandoned American tanks, the old Japanese HQ, monuments and memorials, and more. Many visit to pay respects to family members lost in the conflict all those years ago, while many more simply travel here to immerse themselves in the history of one of the world’s bloodiest eras. Okay, so while it’s clear that there was a lot more to see than we expected on land, we also know why you’re really here…the ocean. There are few better places to see what has made Palau a renowned getaway than the 300 or so Rock Islands. Mostly uninhabited, the islands hold hidden coves, great beaches, blue lagoons, and most everything else you would expect to see if you Googled ‘tropical paradise’. However, that all pales in comparison to Jellyfish Lake. Located inland on Eil Malk, this marine lake is home to a unique breed of transparent jellyfish that are completely harmless. There’s something otherworldly about snorkeling amongst these special creatures…and it’s an experience that helps make the Rock Islands one of the highlights of the Pacific. At the end of the day, it’s the diving that makes this an unforgettable trip. 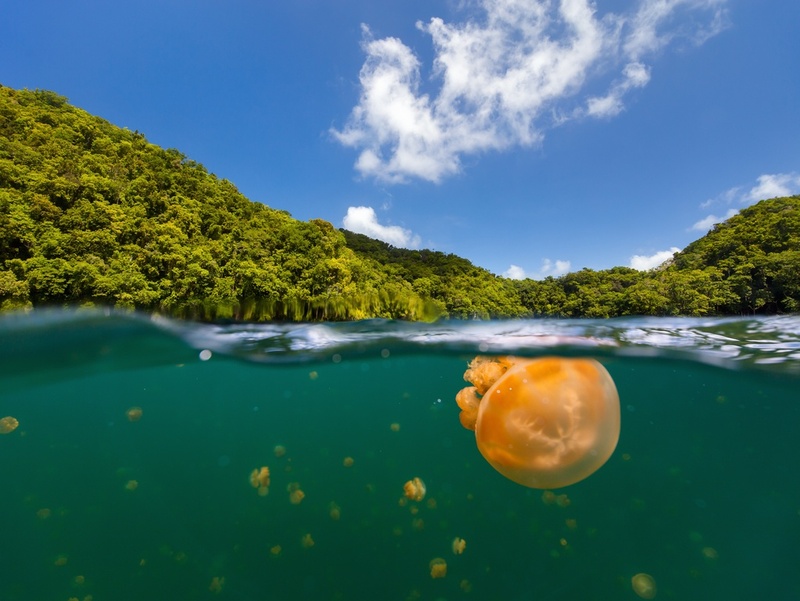 Palau features some of the best scuba diving and snorkeling in the world across its many islands – ranging in difficulty from casual to advanced. Dive into the blue seas and you’ll likely find a diversity of life on par with the African savannah or Amazon rainforest mixed in amongst old shipwrecks. 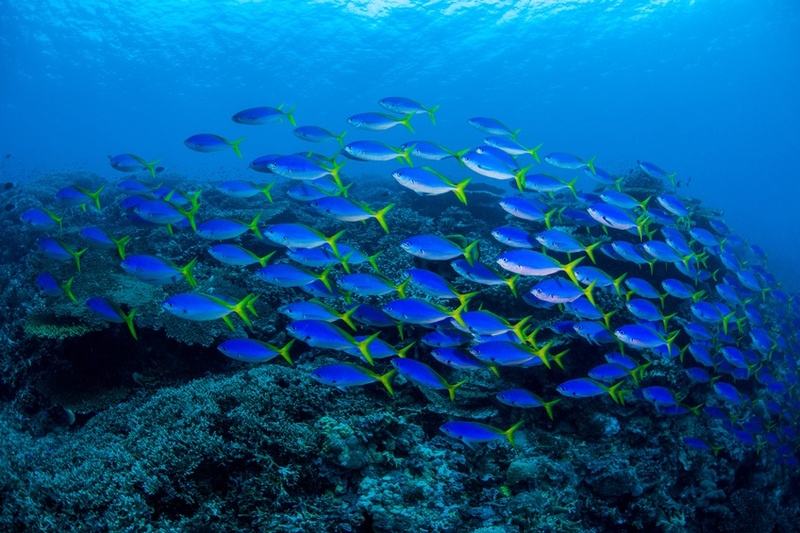 You can find great dives across Palau, however Blue Corner is definitely one of the standouts – with a variety of fish and sea creatures that is nearly unmatched anywhere in the world. Strong currents make this an endeavour for only experienced scuba divers however. As Palau is a bit off the radar, getting there can be a somewhat expensive. 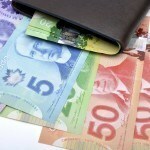 A connecting flight from Pearson to Koror can run about $2000 Canadian. Be sure to shop around as the country you travel through to get to Palau can make a big difference in price. Unfortunately, Palau’s fairly remote location and focus on water-based activities such as scuba diving does drive the cost up. A mid range budget could add up to about $194-$323 Canadian a day, while you could pay considerably less or more depending on what tour package you have, how much scuba gear you need, and what island you’re on. Palau is a very safe country with normal security precautions recommended throughout by the Canadian government. There is some petty crime that you should be aware of, however the main safety consideration is with regards to scuba diving and general exploring. Make sure you stay within your skill level and follow all local rules and guidelines. For more on travel safety, check out the Canadian Travel Advisory for Palau. Share your experience in the comments section! You can also learn more about Palauan history and culture in the Country Profile and buy your US dollars on FXtoGO.